WEIGHT : 13,1 GRAM IN TOTAL. HALLMARK : 925. MATERIAL : STERLING SILVER. 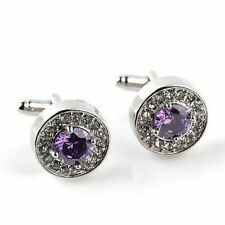 Beautiful Top Quality Heavy Sterling Silver Cufflinks. Stamped 925. Weight 9 gms combined. Elizabeth Duke. UK BLACK STUNNING VENETIAN MASQUERADE EYE MASK HALLOWEEN PARTY LACE FANCY DRESS. Stainless steel material. Gold Pattern design. 90 UK Man Lady Girl Large Full Arm Waterproof Temporary Tattoo Sticker Body Art. These also make an excellent gift. UK BLACK STUNNING VENETIAN MASQUERADE EYE MASK HALLOWEEN PARTY LACE FANCY DRESS. Stainless steel material. Square Black Stone design. I Love You Couple Lover Valentine's Stainless Steel Matching Pendant Necklace. Type: Cufflinks. Colour: Silver. Material: Copper. 1 Pair of Cufflink. ·Due to the light and screen setting difference, the item's color may be slightly different from the pictures. 1 x Black Velvet Bag. Black Knot. Set of cufflinks. Manufactured using finest quality silver plate to give a beautiful gloss finish. your order has been dispatched. Material: Gold Plated Alloy & Austrian Crystal. Free Organza Gift Bag. Each cufflink is stamped 925 to the reverse. Square cufflinks, double-button type. Mother of pearl effect. I am not sure if they are real mother of pearl or faux. Silver-coloured metal. The faces measure just under half an inch across. .
Color: Silver. Note:Due to the difference between different monitors, the picture may not reflect the actual color of the item. This unique design is sure to make you feel comfortable as well as stand from the crowd and add you style. Manufactured using finest quality silver plating to give a beautiful gloss finish. These cufflinks have been lovingly handmade by myself. A pair of cufflinks of a pair of red lips on a black background. They are silver plated. The fronts measure 18 x 10mm. The cufflinks come in an organza gift bag. FREE UK P&P. Beautiful high quality Lithuanian coin cufflinks with enamel painted over them. Please see my 100% positive feedback. Gold Knot Cufflinks. Set of knot cufflinks. Manufactured using finest quality gold plate to give a beautiful gloss finish. You will be. 1 Pair Cufflinks. Type: Cufflinks. Material: Alloy. We'd like to settle any problem in a friendly manner. Color: Blue. Enjoy your life with our wonderful goods. We want to make sure you are happy with our item. MENS 925 SILVER CUFFLINKS. NEW BEAUTIFUL. Dispatched with Royal Mail Signed For® 2nd Class. Border Fine Arts Border Collie Cufflinks. 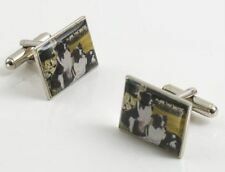 A beautiful pair of cufflinks manufactured by Border Fine Arts of the beloved Border collie dog. Supplied in a presentation box. With their contemporary Brushed Silver finish and classic oval lined border these easy to wear T-Bar Cufflinks are perfect for wearing on all smart occasions. To give them that personal touch you can have them engraved FREE. Ideal gift for all occasions. Rest of the World. Color: Silver White. - Cufflinks size: Approx. Ideal to use with resin to make photo/image cufflinks. This is a navy and gold sideways stripe pattern. Anchor ,Maker A&W 925 pair of weighing scales. Square cufflinks, with traditional design. Silver-coloured metal and marbled green inlay. 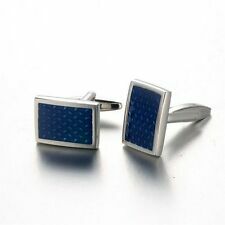 These cufflinks will be supplied in a plain gift box. Condition Traditional style cufflinks, in excellent condition. Vintage cufflinks, scratched but in working order. Gold coloured metal, with blue-grey inlay with a curved surface. They will be supplied in a plain gift box. They are marked and tested for silver. They are tarnished, so need a clean, otherwise there is just minor wear. Color: Silver White. Ideal to use with resin to make photo/image cufflinks. Square cufflinks. Pale amber/orange colour, with silver coloured metallic streaks. Silver coloured metal. 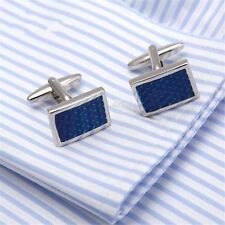 These cufflinks will be supplied in a plain gift box.